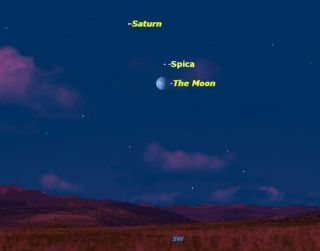 On Sunday, Feb. 12, 2012, Saturn, Spica, and the moon meet in the morning sky. There are two interesting meet-ups in space for skywatchers this week: close encounters between the moon, several planets and stars. The movements of the sun, moon and planets are all confined to a narrow band of sky known as to astronomers as the ecliptic and to astrologers as the zodiac. Almost all of the activities of the major solar system bodies play out among the 13 constellations that mark this band. You may have thought there are 12 zodiac constellations, but astronomers have long known that a 13th constellation, Ophiuchus, is part of this group. There was a great fuss about a year ago when the astrologers finally caught up and began including Ophiuchans in their fanciful predictions. Because all this solar system activity is concentrated in a narrow band, there are many close approaches between solar system objects, known to astronomers as conjunctions or appulses. Two such conjunctions will occur this week, making for some attractive skywatching opportunities. The sky map available with this story shows how the planets will appear together during the cosmic meet-ups. On Thursday evening (Feb. 9) just after sunset, look for the brilliance of the planet Venus in the southwestern sky. If you have binoculars or a small telescope, take a closer look. Just to Venus' left there will be a tiny blue-green speck, a very unusual color for a star. That’s because this is not a star, but the distant planet Uranus, nearly twenty times farther away from the Earth than Venus. The two planets will appear extremely close to each other, about two-thirds of the diameter of the moon. They will easily fit together in the eyepiece of a telescope, and will present an amazing contrast in brightness, size, and color. Two nights later, just after midnight on Sunday morning (Feb. 12), Saturn and the waning gibbous moon will rise in the southeastern sky, with the first magnitude star Spica framed between them. As the morning progresses, the moon will slip underneath Spica. Its proximity to this bright star makes its rapid eastward movement very obvious. While watching these three objects cross the sky, you won't be able to miss bright Mars leading the "parade" one ecliptic constellation ahead in Leo. Once Sirius — the brightest star in the sky — sets around 2:30 a.m. local time, Mars will be the brightest object other than the moon in the sky.